Pearls are one of the world’s most popular and precious jewels. While they are resilient, pearls are also delicate items that need proper care. This pearl care guide is designed to help you enjoy your HinsonGayle pearl jewelry for generations to come, by insuring your pearls get the care they need! HinsonGayle pearls are designed for everyday wear and everyday elegance. Each day you wear your pearls, it is important to remember to add your jewelry as the final piece of your outfit, and only after applying make-up and styling your hair. To preserve your pearls’ luster, avoid letting them come into contact with cosmetics, hairspray, perfume, or perspiration. Why? Because pearls are organic gemstones, making them susceptible to acid and alkaline. Because of this, it’s a great idea to give your pearls a once over with a soft cloth before returning them to their storage box. To preserve the perfection of your pearls, it is important to store them properly. To prevent tangles and scratches, fasten clasps and lay them separately in a compartmentalized jewelry box. When traveling, use a protective jewelry pouch. To prevent your pearls from dehydrating, make sure you do not leave them in a security box for extended periods of time! In fact, the more you wear your pearls, the longer they will maintain their luster! Before wearing your jewels, check parts such as prongs, clasps, earring backs, and pins. While we stand behind the strength and quality of our necklaces, the silk thread they are strung with may stretch or loosen over time. We recommend having your pearls restrung every year so they can be loved and worn for years and years! What we love most about our pearls are the fact that they can truly be worn every day. With this in mind, it is wise to not dip pearl strands in water such as showers, baths, or swimming pools. Doing so could weaken the silk thread that strings the pearls together. It’s also smart to try and avoid wearing your pearls in high heat and sunlight. If your pearls come in contact with vinegar, detergents, juices, or other acidic items, quickly wipe them off with a soft cloth! By following these simple guidelines for pearl wearing, your jewels will last for generations. 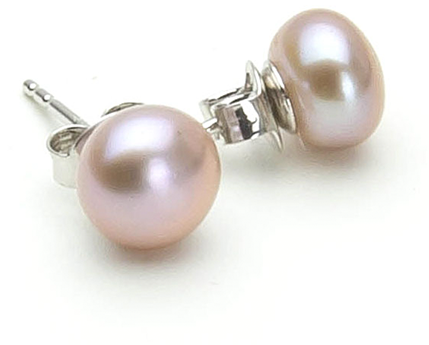 You never want to clean your pearls with abrasive material, anything containing acidic properties, an ultrasonic cleaner, steam, or tarnish remover. If you notice the radiance of your pearls diminishing, take them to an expert to be cleaned. Precious jewels deserve precious care! Frequently check earring backs. Pinch the butterfly wings gently together if the backs become loose.